New and inexperienced traders tend to spend most of their time researching technical analysis techniques or trying to refine the best entry and exit techniques. Whilst entries and exits are important they aren't nearly as important as risk management. This is the area initially most overlooked by novice traders and sooner or later it will rear it's ugly head when a position goes into or loss or drawdown situation. Having the courage to deal with a loss and accept it is extremely difficult for a lot of traders and a bad situation can very quickly become an account threatening disaster unless action is taken. 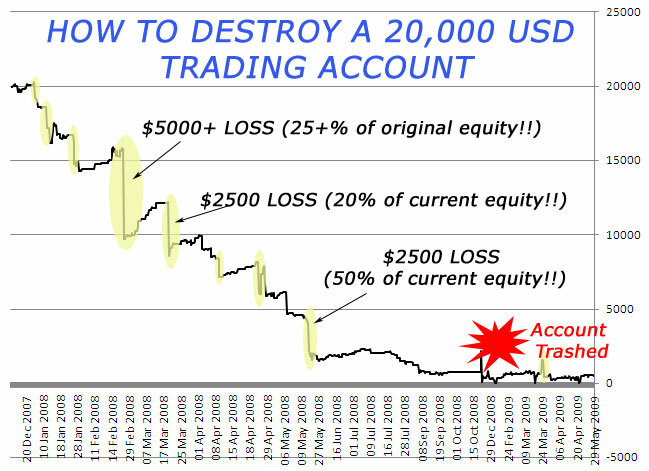 The equity curve below is real - it shows what happens to a 20k USD account when risk isn't managed properly. This is a good example of the 'hope' strategy going horribly wrong! 2% X 5,000 = $100 = ONLY $650. The Zeus Risk Controller would have preserved $9,350 in account equity and given the trader a fighting chance of keeping the account alive. 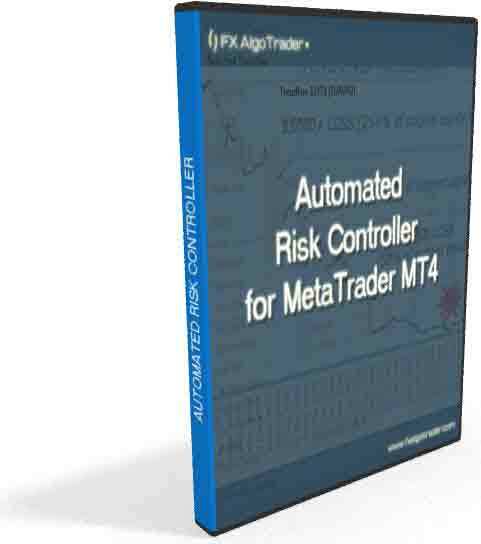 FX AlgoTrader's "Zeus Risk Controller" (Zeus) is an expert advisor (EA) which continuously monitors the MT4 Trade terminal for single or aggregated orders which exceed a trader defined maximum risk threshold. Zeus will monitor and automatically aggregate the profit/loss and order swap values for pairs with multiple orders. Eg. If the aggregated loss for all EURUSD positions is greater than say 2% of the current account equity the system will automatically close all the positions. Zeus will automatically aggregate the order profit/loss and orderswap values for a given pair. Eg if the aggregated loses for all GBPUSD positions is greater than 1% of account equity the system will alert the trader and prompt for confirmation. If the trader decides to close the positions he/she clicks "Yes' in the messagebox and Zeus will automatically close all the GBPUSD positions on the trader's behalf. Zeus will constantly monitor all positions individually. If the order profit/loss and combined swap values exceed the maximum trader defined loss Zeus will prompt the trader with the order number, symbol data and ask the trader whether he/she wants to close the position. If the trader clicks "Yes" the position will be closed on the trader's behalf. Fully Automated Operation with Manual Overide Zeus can be configured to run in a fully automated mode or can be manaully overidden by the trader. Trader Definable Maximum Risk The trader can precisely define the maximum risk as a percentage of account equity. Voice Synthesized Alerts System Zeus uses a proprietory voice synthesis algorithm to provide as much information as possibe to the trader in the most expedient way. The voice synthesis system ensures the trader is kept completely up to date with all system based order management processes. "I just wanted to write a review of Zeus for you as it saved my neck today - I have discipline issues! If you are planning to do trading as a source of income and dont have a risk controller of some sort then sooner or later what would have happened to me today WILL happen to you. That being a wipe out of your account. Using Zeus I limited my risk to only 2 % and I was stopped out , this gave me the smack I needed to realize the market had turned , thus I waited for a slight retracement in the downtrend and entered short, for a nice profit exceeding the loss . The difference between where I am now and where I would have been is about $500 , I would recomend this to anyone , but use it on a demo first to get used to what lot size and risk setting you should use . Cheers Crispin for another useful product"
Over trading after a big loss and making an even bigger one! When action is required to be taken - the Zeus Risk Controller takes it automatically. Short term forex traders would benefit from enhanced asset selection when using MA crossovers. Products such as the Orion Index Analyzer, the Range Analyzer or the Generic Index Analyzer all help traders to optimize their forex pair selection and massively reduce the requirements to perform top down analysis on all the major pairs and crosses each day.